Thai demonstrators donning white shirts, lighting candles, releasing white balloons and carrying placards stating “Respect My Vote,” are portrayed as ordinary people who simply want to defend the democratic process against growing anti-regime protesters. However, it was clear from the beginning that it was nothing more than a rebranding of the regime’s “red shirt” enforcers in an effort to confuse the public both in Thailand and internationally. Image: The regime believes the Thai people, and more importantly, international audiences are as ignorant as they are gullible. 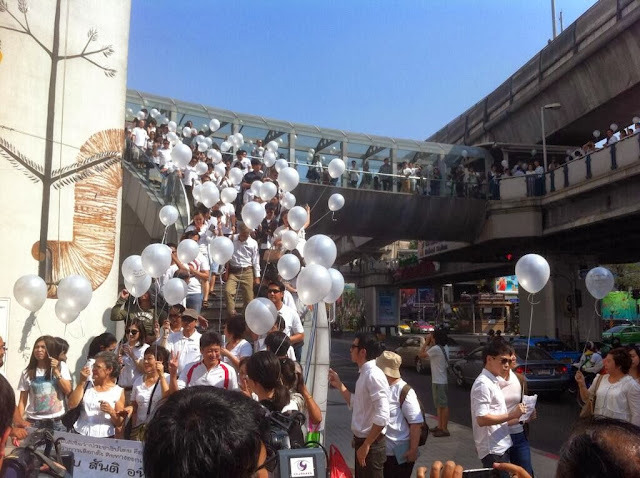 Recent propaganda campaigns featuring “white” balloons, candles, shirts, and ribbons are being passed off as a groundswell of support by “the people” in favor of up coming elections. In reality, these campaigns of “support” are being engineered by the regime itself, by it’s own “red shirt” enforcers and TV networks. …. Despite the regime’s own propaganda network, Asia Update TV, creating and leading the movement with presenters even trading in their red shirts for white – more sophisticated pro-regime propaganda attempted to perpetuate the myth that these were ordinary people. It is now incontrovertibly exposed that these “white shirt” protesters are merely the regime’s “red shirts” in one last desperate, disingenuous attempt to marshal support in the face of a growing tide of genuine and immense dissent. IF YOU WANT TO KILL CORRUPTION, END THAKSINOCRACY, IT MUST BE DONE IN THE NEXT ELECTION. Later, the woman can be seen, her sign missing and reduced to tears while police attempt to keep back regime supporters. Careful inspection of the protesters reveals many to be wearing red wrist bands, red ribbons, and even red shirts themselves under regular or white attire. In other words, the same intolerance of differing opinions, violence, and intimidation that have become the hallmarks of Thaksin Shianwatra’s red shirts were there – because it was a red shirt protest. Image: White balloons for sham elections. A hundred or so people gathered in downtown Bangkok amid much larger anti-regime protests, to support the current regime and their single-party election planned for February 2, 2014. All opposition parties have boycotted the election, featuring deposed dictator, accused mass murderer and convicted criminal Thaksin Shinawatra running as defacto party leader. While the group, calling itself “Ant’s Power” attempts to appear as “pro-democracy” advocates, they are simply regime supporters who have exchanged their red shirts for white ones. The unfortunate woman most likely thought, like many others who may have been bolstering the numbers of similar rallies, that this was truly a “pro-democracy” demonstration, and did not suspect it was created for and by the regime of Thaksin Shinawatra itself. The degree of deceit and intellectual dishonesty, not only of the regime and its propagandists, but those attempting to promote the “Respect My Vote” campaign as anything but insulting, poorly disguised regime propaganda illustrates exactly why anti-regime protesters have spent months occupying Bangkok’s streets, and why anti-regime rallies have drawn hundreds of thousands, dwarfing even the largest pro-Thaksin rallies years ago at the height of his popularity. The “Respect My Vote” campaign, just like the white-clad protesters perpetuating it, upon closer examination, literally have red showing underneath. Elections overseen by a regime openly run by a convicted criminal hiding abroad as a fugitive are not legitimate, nor is any regime that results from these sham elections. Image: The New York Times openly admits that Thailand is currently run by unelected convicted criminal/fugitive Thaksin Shinawatra. Clearly any proxy government or elections in which it participates in are illegitimate by both Thai and international standards. Thaksin’s foreign ties are what have afforded him impunity regarding an otherwise cartoonish, 3rd world dictatorship. There is no question that an accused mass murderer and convicted criminal hiding abroad from a 2 year jail sentence, multiple arrest warrants, and a long list of pending court cases, is illegally running Thailand by proxy. Being unelected, Thaksin Shinawatra is by all accounts a dictator, and his “government” a regime, however cleverly they try to dress it up. As reported many times before, current anti-regime protesters are not trying to end “democracy.” They are simply trying to end the abuse of the democratic process by an overt criminal. Elections must be carried only after Thaksin Shinawatra and his entire political machine have been safely and completely dismantled.